This page provides an in-depth look at contemporary approaches to food production, including GM Crops, Vertical Farms and In Vitro Meat. The page is set up for students to work independently or teacher led through bespoke enquiry questions and activities alongside a noting sheet to identify the advantages and disadvantages of each approach. There is also the opportunity to develop a class debate around three key statements on the approaches. The tasks can be completed as part of the preparation ahead of the class debate. The resources develop specific place examples and explore the impacts of these approaches on food security and long term environmental sustainability. What are the advantages and disadvantages of different contemporary approaches to reducing food insecurity? 1. Class Debate Preparation _ Students can either be teacher led through the activities below which includes enquiry based questions, worksheets and video based questions, or they can complete the activities as part of the independent research for the debate statement below. That GM food is the answer to world hunger? 4. Students can study the map showing productivity yield. To what extent does it show a worrying trend? 5. Students can following this up by reading the extract and and can make notes on the extent to which it supports the views of Vindana Shiva. 1. Students should use the resources in an enquiry approach to answer the question, to what extent are GMOs the answer to world hunger. print the packs out and get the students to work for 30 minutes in groups. Students can either be teacher led through the activities below which includes enquiry based questions, worksheets and video based questions, or they can complete the activities as part of the independent research for the debate statement below. The best format for this debate will include two people per team with 4 people per debate. As part of the preparation students should prepare a summary of their arguments to give to the class who will partcipate through questions and judge the outcome. Students should investigate the following enquiry question using the resource provided. Print it out and cut it up as selection of text resources and graphics. Students should then uses the information to build up their own argument on how effective GM food has been for increasing food production. To what extent can it be claimed that GM food is the answer to world hunger? focused on improving food production? What does the last graphic on Increasing number of resistant weeds suggest is a problem with GMOs? To what extent are GMOs more about profit than food? Why do you think feeding the hungry and providing resilience to climate change seem to be low down on the list of priorities for companies like Monsanto? Students can also watch this short clip from Vandana Shiva covering her criticism of GMOs. Students should identify a number of potential positive steps in the form of direct increases in food production. Give the following three infographics to groups of students or place them around the room and students should fact find the potential for future food production the three staples, potato, wheat and rice. Watch the following video clip from MIT Technology Review and make notes on how the new GM variety potato can resist blight. Research how in Rwanda they have successfully introduced GM climbing beans replacing the traditional bush bean and directly increasingly farmer income and food production. 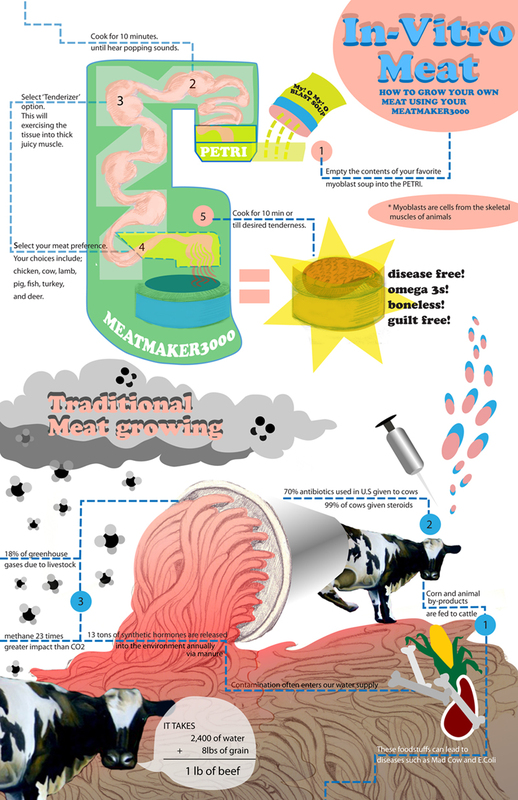 Using your jigsaw make notes on the advantages of In Vitro Meat versus conventional beef production. Read the following text from Discover Science and make note the challenges and disadvantages of In Vitro Meat. Read the following Guardian article that questions the productivity and reach of vertical farm projects and make notes on the problems the article with vertical farms the article identifies.